At Moneck, we understand the importance of feature rich virtual terminal and gateway to a successful and profitable business. We've been in your shoes in the past. In the past, our business and our client's business rely on virtual terminal and gateway offered by large company such as Authorize.net, Paypal and E-processing network to secure our payment processing. However, the lack of features and easy integration options make large company really hard to work with. Moneck's virtual terminal and gateway solutions offer far more features and benefits than other companies do, while providing the better secure and fast payment processing capability. With Moneck's highly appreciated chargeback prevention services, merchant can rest assure and focus on their profitable business. Moneck Gateway provides reliable, secure and affordable state-of-the-art integrated payment processing services. 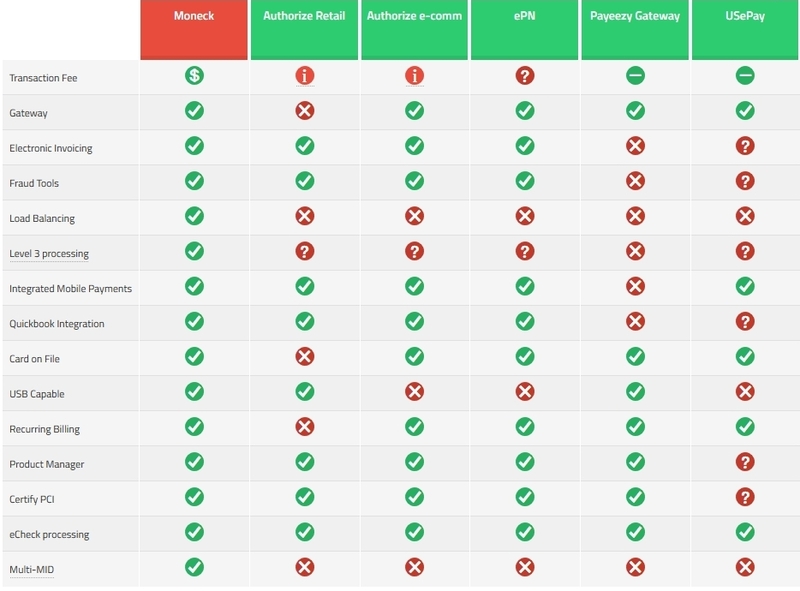 With more features than other gateway services, Moneck gateway provides processing for virtually all payment types and offers 100% PCI compliance and other e-commerce, retail and charity friendly features. Moneck gateway allows business to accept payments over the phone or via the internet on mobile device or virtually from anywhere. Moneck gateway routes your payments seamlessly and securely with SSL encryption from multiple payment devices and configurations - from your point of sale, or over the internet via wireless devices and more. Moneck Gateway is the virtual terminal & gateway solution for profitable merchants. Worry about losing sensitive customer data to hacker and cyber-attack? Moneck gateway is designed to maintain cardholder information in the sandbox that can only be accessed by the merchant on-demand. Our gateway is architected to prevent unauthorized access including real-time Intrusion detection, file integrity systems, SSL encryption and a 24/7 monitored network. This means you can focus on your profitable business and have a peace of mind. You don't have to worry about unpredicted data breaches or being out of PCI compliance with the Payment Card Industry Data Security Standards. Multiple Merchant IDs Support - Accept transaction from multiple merchant IDs in the same payment gateway and virtual terminal. Filter report based on merchant ID. Load Balancing - Cloud based gateway and virtual terminal architect to ensure highest availability and up-time. Check out Moneck Gateway "How-To" Videos.